Have been shopping for a fitted card table for quite some time and this one fits perfectly! A great way to "restore" an old table! I use it on my old and scratch folding table. It makes it look like new! I ordered one of these before and like it so well I ordered 2 more. 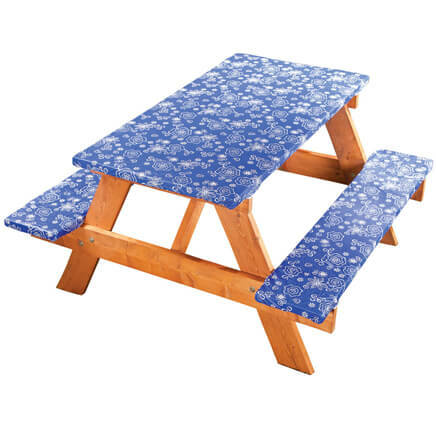 I have some rectangular folding tables I use for extra dinner seating or to set up an outdoor bar. Regular table clothes were too large and with too much overhang, people would pull them off just getting out of their chair. These are perfect, they stay in place and, when used outside, they won't blow away. I am going to use it on an outdoor table for Thanksgiving, lots of family coming. Out door table looks terrible and has weathered and ruff surface. The fit was perfect for our iron patio table. 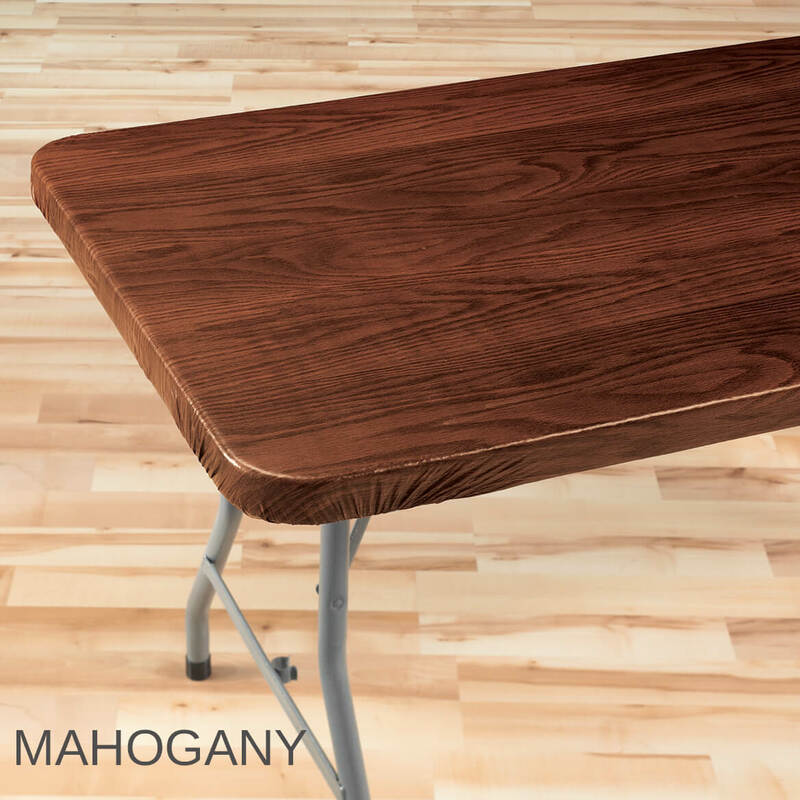 The woodgrain table covers are a great way to show and retain the beauty of real wood tables while protecting them from daily use. Because they are fitted, they won't slide. I have used them on several tables with different colors, including holiday prints. 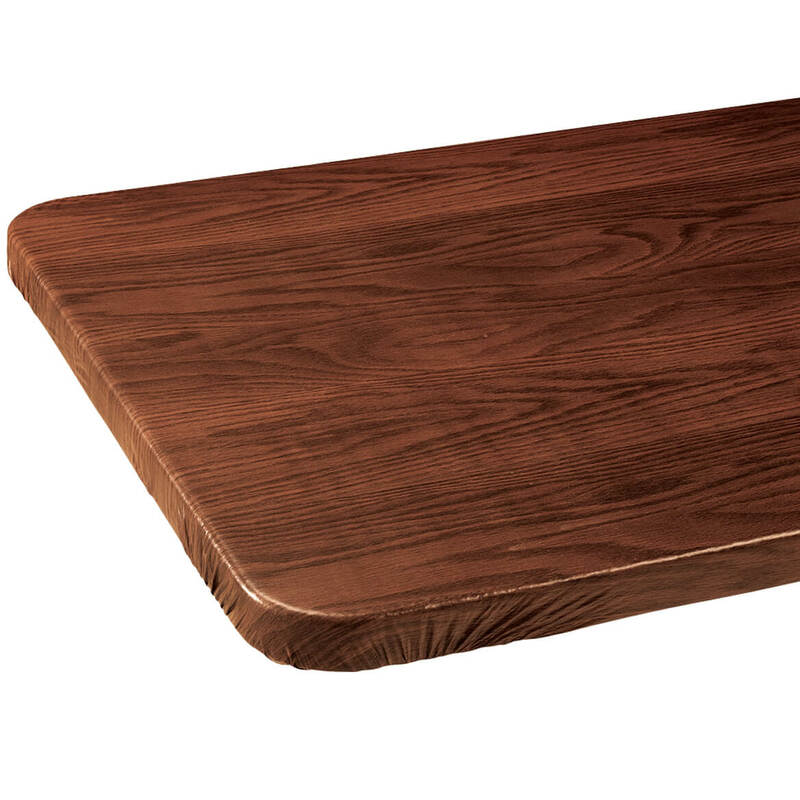 I ordered the 48 X 24 the smallest size offered for my small cherry wood coffee table in my living area for protection. It fits and stays on well. I wish this size was offered in more variety of colors. Great design but did not fit correctly. I ordered this tablecover to "repair" the hole I melted in the original card-table plastic. It doesn't fit my table as snugly as in the picture, but it is doing the job. I did not measure my table before ordering, maybe it is not a standard size. I would buy product again, just not this size. I am actually returning this product due to size. I assumed a 36" square would fit a card table even though the table is slightly smaller. It does not. I have another similar cover for my oval dining table and it fits with or without the two extra leaves. This square table cover is way too big for a standard card table. I like the product just not the size. 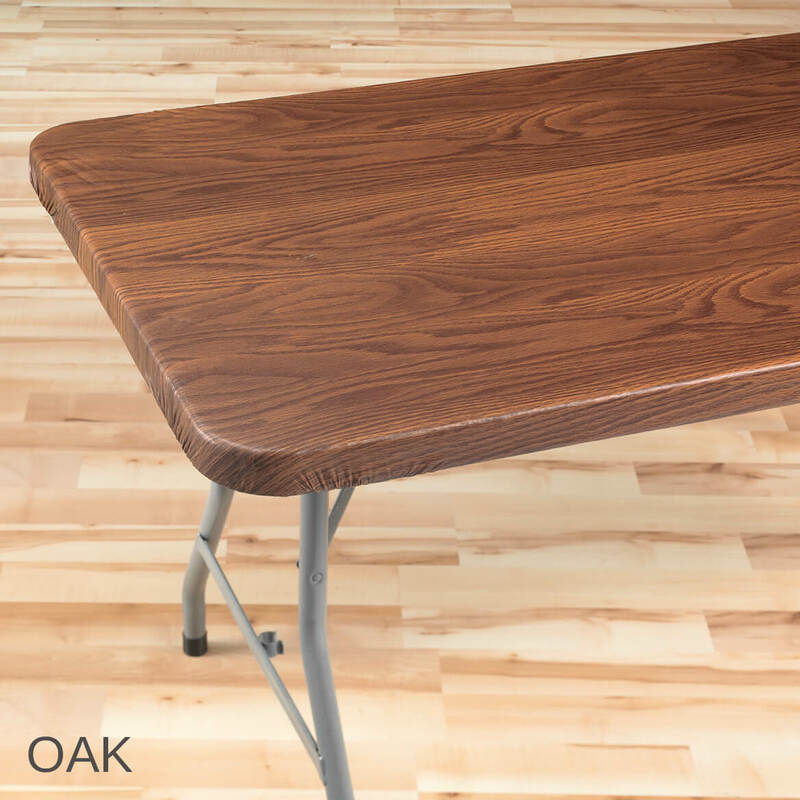 The wood grain flannel backed table cover covers the table, but has very little elastic to hold it in place. It is wrinkled and doesn't really look nice at all. It is also way overpriced for the quality you get! this was a waste of time and money... its completely cheap looking and smells like horrible horrible plastic. guess I'll use it for a crafting table cover if it doesn't rip. Never Again - poor quality, poor customer service. I purchased these in the 4' x 18" size over the summer for our church for class rooms. When I received them, I put them in the storage room with other class supplies. In the Fall, we tried to put them on the tables and they were horrible! They were loose, the elastic was on the corners only so the sides were not snug and they were impossibly wrinkled. We only opened 2 out of the 24, but because we did not try them on when they arrived, we missed the return date and they would not give us even just credit towards other merchandise. We ended up throwing them away - they were simply not usable. Lesson learned, no more purchasing from Walter Drake. Horrible quality, worse customer service. The table cover tore before we even got it completely on the table. The actual size was smaller than what it said the dimensions were. I think my 10 covers was dry-rotted, they split as I was putting them on the tables. I would not buy this product again unless it was modified!! Does not fit the tables, so it will not stretch out to take out the wrinkles and one tore while I was putting it on the tables. Not what I expected. Was dissappointed. Quality was less than I thought it would be. Excited about finding 36x36 size but disappointed it wouldn't stretch to that size. Have ordered a different size in the past and am pleased with the way they fit my tables. 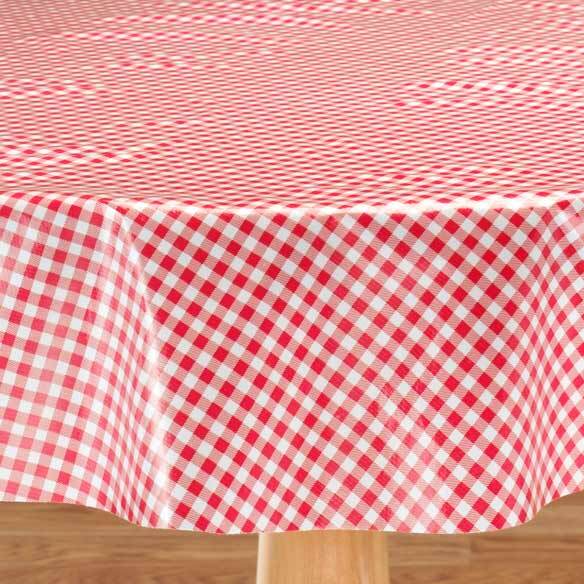 Hard to find an elastic tablecloth that can be used outdoor and is for a six foot table. We have a vintage kitchen table with a less desirable designed porcelain top but we love the table overall! To cover a ripped card table. Needed to protect kitchen table from scratches plus snug fit with no skirt. To make the old (paint smeared) card table look presentable and clean. I thought this would be better than a sheet for the banquet tables used for a garage or yard sale. The wood grain patterned table cover will look great for parties too! I bought two 72x30 in the mahogany color. Fits perfect my 6 ft.table.color beautiful. Hopefully it will cover marred picnic tables. This is the only place I have found 36" vinyl table covers. I have shopped Miles Kimball previously and been satisfied. I wanted to protect my new table that had the same wood grain pattern as the table covering. Most people don’t realize I have covered my table until they look closely. I needed a small table cover for my little table on my front porch. I like the fact that it won't slip like traditional tablecloths. Have ordered these in the past. Good quality. Love the colors and needed for my card table. I have older card tables and great nieces & nephews that spill things. I also have the large oval one that I ordered from MK years ago for my dining room table. It works great. Looked like a great item. 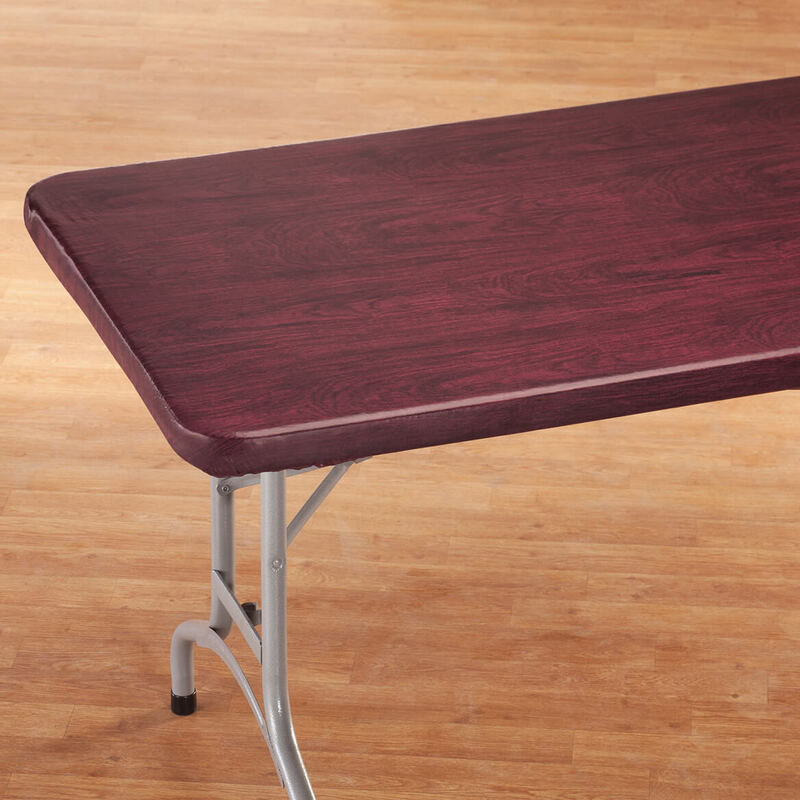 Tables used for everything and not looking their best ... this looks good and wipes off easily. Since I am an Amazon Prime customer, shouldn't this order qualify for next day shipping? Well, we have bought before and like the style and the color. 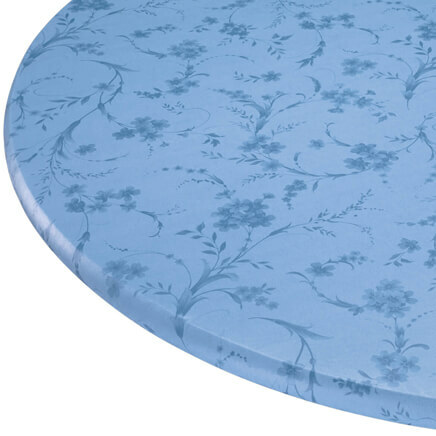 I need an elastic edged cover for my new table so my cats can't scratch it or remove the table cloth. This is larger than my 30 inch table but I hope I can make it work. Would be nice if there were a choice of sizes. The size for this table is hard to find, was thankful to have found it. Cover up old table make it look nice again. Can the sides stretch to fit a 60 x 36 size table? BEST ANSWER: Thank you for your question. No they cannot. We hope this information will be of help to you. How long do these typically last? I am thinking about using it for our party room for weekly children's birthday parties instead of buying plastic table clothes. BEST ANSWER: Thank you for your question. With normal wear and tear they can last quite a while. We hope this information will be of help to you. 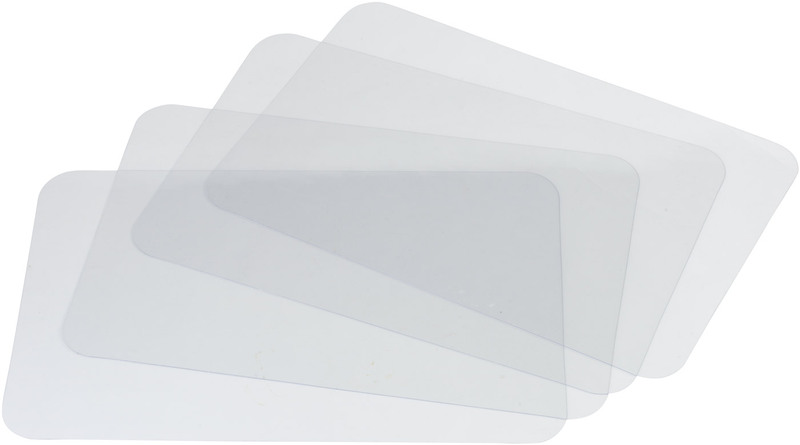 These are perfect for what you are wanting to use them for. I bought them for when my grandchildren come. They are wonderful. I put one on my kitchen table for eating and I put one on my dining room table for their crafting. My table is 62” long with 2” sides. Will the 60” x 30” fit? BEST ANSWER: Thank you for your question. 60" is the max length, it will not fit a 62". We apologize for any inconvenience. How do you get all the wrinkles to flatten out for the card table covering? BEST ANSWER: Thank you for your question. You can try putting the table cover into the dryer on a low setting for ten minutes. We hope this information will be of help to you. Table is 72" long. Will the 30" x 72" stretch to fit over thickness (1 1/2") of the ends? BEST ANSWER: Thank you for your question. Yes the table cover will fit your table. We hope this information will be of help to you. I really want this but my table is 48 by 36 without the leaf, will the 60 x 36 work OK for me? BEST ANSWER: Thank you for your question. 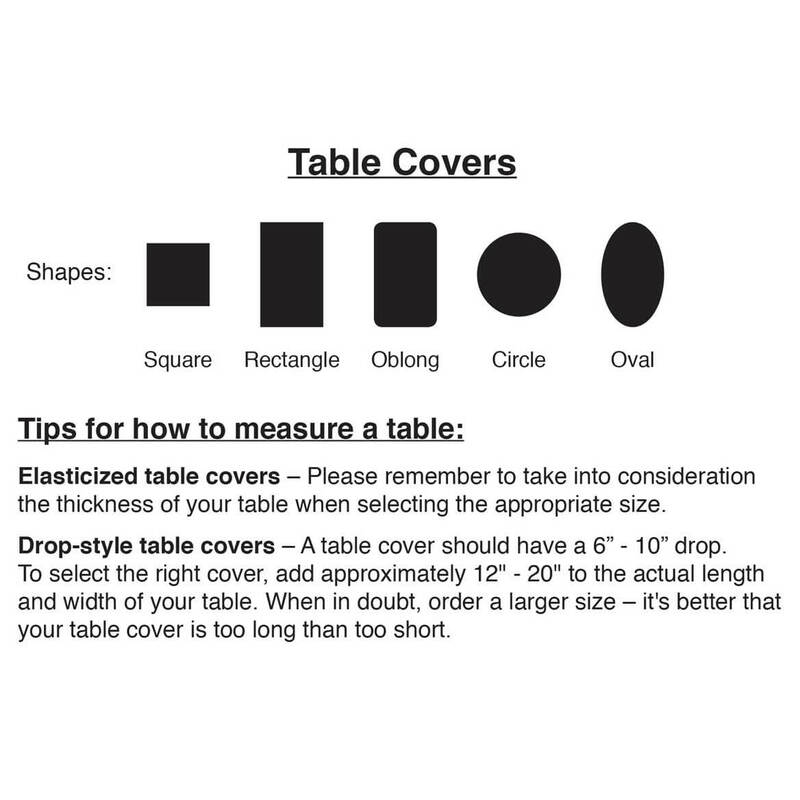 The cover will fit your table, there will just be extra material in the length that will be under your table. We hope this information will be of help to you. 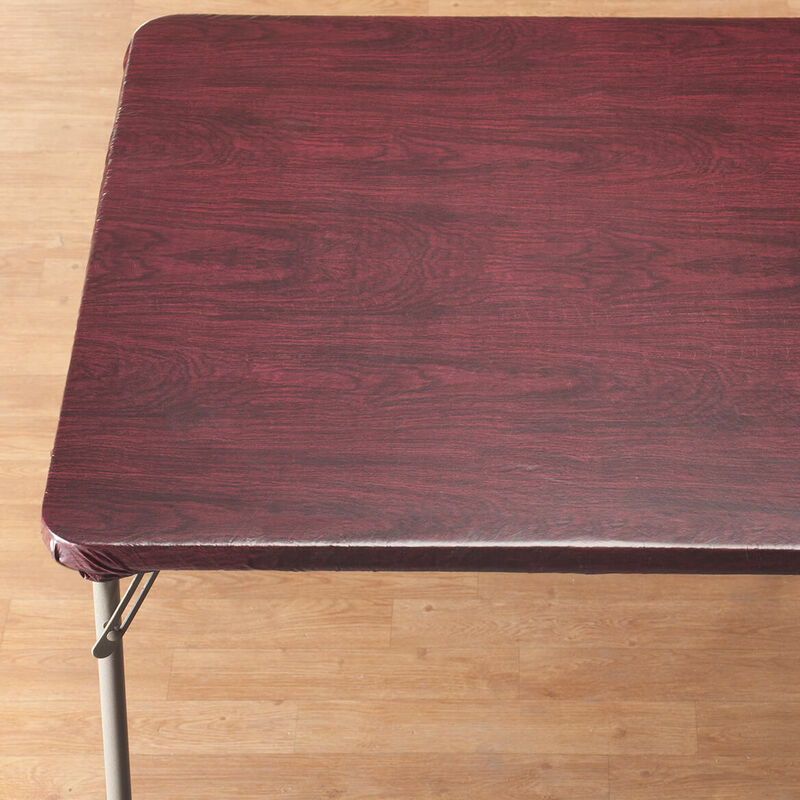 table measure length 60 width 35 fitted table cloth help........... whats the best size for this table? BEST ANSWER: Thank you for your question. Unfortunately we do not have a cover that is wide enough for the 35". We hope this information will be of help to you. BEST ANSWER: I think pine would be the lightest and mahogany the darkest; oak would have the most prominent grain.There appears to be an inset in the second picture that probably shows the color. 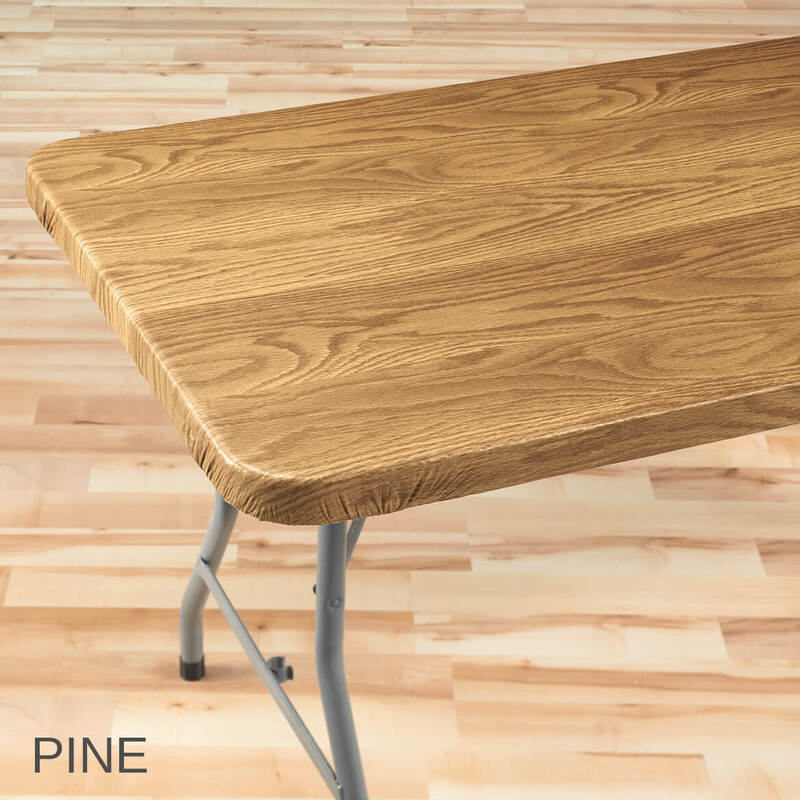 Pine is the very light shade. Oak is in between and mahogany is the darker shade. does it fit well over a 33" square card table? BEST ANSWER: Thank you for your question. Unfortunately no the table cover would be too large for the table. We hope this information will be of help to you. Will the square 36 x 36 fit my table with these dimensions AND cover the 2 in deep sides? I want this to fit snug and look nice. BEST ANSWER: Thank you for your question. 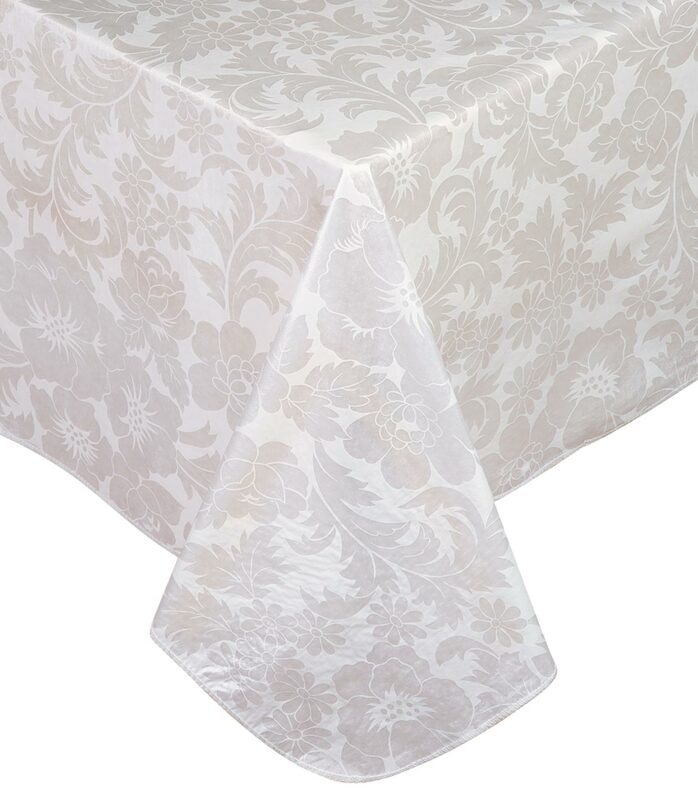 The table cover will fit your table with a 2" depth. We hope this information will be of help to you. I have a rectangular table size 52x34, is there one to fit this size? BEST ANSWER: Thank you for your question. Unfortunately no this table cover will not fit your table. We hope this information will be of help to you. Soupy have any cover for triangle?